TRAVERSE CITY– A proposal to run an oil pipeline beneath a crucial section of the Great Lakes cleared its final hurdle Wednesday, gaining approval of a Michigan panel created a week earlier in a dash to complete the deal before Republican Gov. Rick Snyder leaves office. The three-member Mackinac Straits Corridor Authority unanimously backed an agreement between the state and Canadian pipeline company Enbridge to drill a tunnel through bedrock up to 100 feet below the more than 4-mile-wide channel that links Lakes Huron and Michigan. A new segment of pipeline would extend through the tunnel, replacing twin pipes that have lain along the lake bed since 1953. They are part of Enbridge’s Line 5, which carries crude oil and natural gas liquids used in propane from Superior, Wisconsin, through northern Michigan to refineries in Sarnia, Ontario. Line 5 has drawn fierce criticism in recent years from environmental groups, native tribes and tourism-related businesses fearful of a rupture that, according to worst-case scenarios outlined by university researchers, could pollute hundreds of miles of Great Lakes shoreline. Enbridge has steadfastly defended the pipelines, contending they are in sound condition and could last indefinitely. But with public pressure mounting amid reports of gaps in protective coating and dents from a ship anchor strike in April, the company embraced the tunnel option. “Today’s actions will result in the removal of the oil pipeline from the bottom of the Straits of Mackinac, maintain critical infrastructure connections between our peninsulas, provide energy security for residents of the Upper Peninsula and northern Michigan and create good-paying jobs,” Snyder said. His successor, Gretchen Whitmer, who takes office Jan. 1, has criticized the tunnel plan and called for decommissioning Line 5, as has incoming attorney general Dana Nessel. Both Democrats have said little about the situation since their election last month and it isn’t clear what steps they could take to derail the plan, which Snyder and the GOP-controlled Legislature have attempted to make bulletproof. Critics vowed to continue the fight. For Love of Water, a Traverse City-based environmental group, denounced the negotiated agreements and the approval process as “a sham” that raises constitutional questions, particularly involving the creation of a public body — the straits corridor authority — to oversee transport of a private company’s product. “They have ignored hundreds of thousands of public comments calling for a shutdown of Line 5 and millions of mid-term votes for an incoming administration which pledged to protect our Great Lakes, not a foreign oil company’s profit margin,” said Beth Wallace of the National Wildlife Federation’s Great Lakes office. Enbridge officials and workers, many of whom praised the plan during the panel’s meeting near the straits in St. Ignace, Michigan, noted it requires the company to cover all costs of designing and building the tunnel, estimated at up to $500 million. The structure would encase the pipeline in thick concrete, virtually eliminating any threat of a spill, they said. “The tunnel project is an investment in Michigan that will make a safe pipeline safer,” said Brad Shamla, Enbridge vice president for U.S. operations. 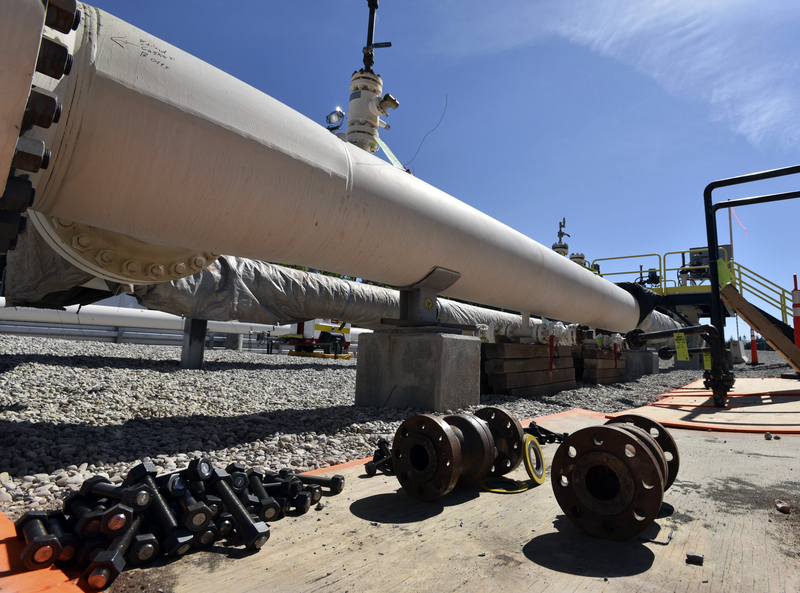 Opponents complained that the existing Line 5 pipes, which carry about 23 million gallons of petroleum liquids daily, will remain operational until the new segment is running. The pact sets no deadline for switching the oil flow to the new pipe, although Shamla said the target date for finishing the tunnel is 2024. Numerous speakers pleaded with the straits corridor authority to postpone a decision and take more time to study the agreement, which was made public only last week. But Chairman Michael Nystrom said the panel was required to proceed if convinced the agreements between the state and Enbridge met criteria outlined in the law that created the authority. The panel voted 3-0 to accept the tunnel pact and authorize the company to drill in the Great Lakes bottomlands.